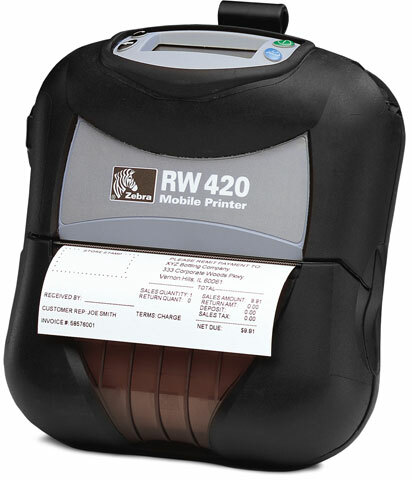 RW420 Direct thermal mobile printer 203 dpi 4" print width Wi-Fi (802.11b/g) USB/RS-232 interfaces Bluetooth. Magnetic Stripe and Contact Smart Card reader. Includes belt clip. Charger and interface cables sold separately see accessories. RW420 Direct thermal mobile printer 203 dpi 4" print width USB/RS-232 interfaces Wi-Fi (802.11b/g). Includes belt clip. Charger and interface cables sold separately see accessories. RW420 Direct thermal mobile printer 203 dpi 4" print width USB/RS-232 interfaces Magnetic Stripe and Contact Smart Card reader Bluetooth. Includes belt clip. Charger and interface cables sold separately see accessories.